Paul Roos is a leader, a legend, an AFL icon. As a first-rate player, premiership-winning coach and in-demand commentator, Roos has achieved extraordinary success over more than thirty years in footy. He started playing in 1982, when footballers and coaches were part-time and it was survival of the fittest. In the mid-90s, as Roos was nearing the end of his 356-game career and the competition was becoming fully professional, he wondered if there were better ways to nurture talent and empower players to build a champion team. When he hung up his footy boots in 1998, Roos penned a list of 25 key coaching points that he hoped one day to put into practice. In 2002, he was appointed head coach of the Sydney Swans. In 2005, he led the Swans to their historic drought-breaking premiership by following his own coaching and leadership philosophy. 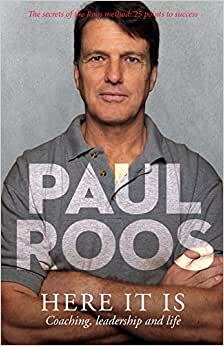 In this candid book, Roos not only reveals his 25 coaching tips but also, for the first time, shares his original premiership blueprint with its foundation of positivity and unity. Roos describes how he took his plan and the lessons learned at the Swans to rebuild the Melbourne Demons, a club that was on its knees when he was appointed coach in 2013. He shares his insights about keeping perspective, motivating people and the importance of building strong relationships. Part sporting memoir, part leadership game plan, this book is a masterclass from one of the all-time greats. Start reading Here It Is on your Kindle in under a minute. The exclusive, no-holds-barred full story of supercoach Paul Roos' coaching career at Sydney and Melbourne and his top 25 coaching tips for creating a champion team. Paul Roos is a former AFL footballer and senior coach. He played 269 games for Fitzroy and 87 for Sydney. He was a two-time All-Australian captain and has been inducted into the Australian Football Hall of Fame. He coached the Sydney Swans from 2002-2010 and led them to the AFL premiership in 2005. He coached Melbourne Football Club from 2014-2016. He lives in Melbourne with his wife and two sons. This book gives a great insight into new coaching methods introduced by Paul Roos. His culture based team orientated programs obviously creates better outcomes for sporting teams and business groups. A very educational read. This book was quite interesting and well written. As the publicity says Paul Roos is a former champion player and a premiership coach of the Sydney Swans in the Australian Football League. He comes across as a nice guy who has a tough streak in him, which you need to be successful in the sport. When he retired from playing he wrote down 25 key points he believed would make a successful coach and person. It could transfer to everyday life and he is big on communication and team work. I found this book to be a good read and thought provoking. It is one of the better books available on AFL and one to keep.